When my husband and I first got married my mother-in-law gifted me a set of cast iron skillets. I had no idea what to do with them. Having grown up in the Pacific Northwest the only cornbread my mother really made came from a box or we ate at restaurants. So not knowing what to do with them, I washed the skillets and let them sit to dry. Never, ever, do that to your cast iron skillets. They rust; really, really, rust. In order to hide the evidence I stuck the skillets in a drawer. Then after a few years had passed I decided to take out my skillets and see if they could be saved. After a lot of seasoning they look awesome now. They never get washed, just wiped out and then wiped again with a bit of oil. Cast iron skillets are great, they never stick if you season them correctly and they last for years. My kids are already fighting about who will inherit mine when the time comes. 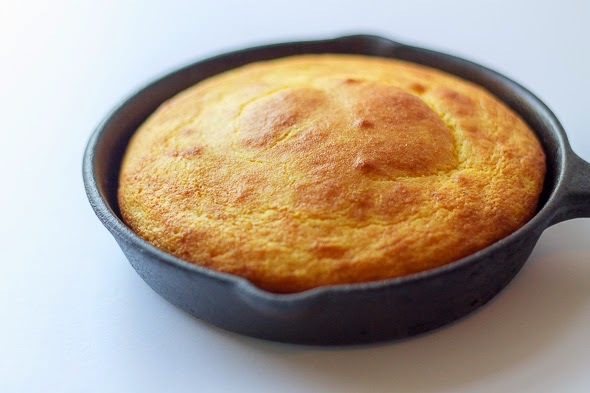 The best thing about cast iron skillets is cornbread. 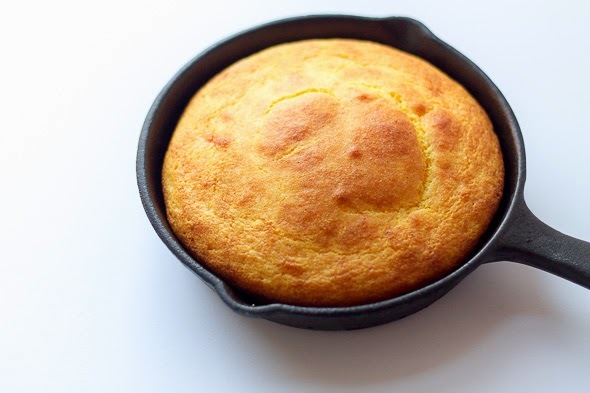 You really can't compare cornbread made in a cast iron skillet with cornbread made in a regular pan. The skillet makes a delicious golden brown outside crust that is so good! The following is a recipe for skillet corn bread. This recipe has a small amount of sugar, my husband prefers no sugar whatsoever in his cornbread, but my kids like a small amount so this is the compromise. If you want true southern cornbread leave out the sugar. Place 1-2 tablespoons of oil (or bacon fat) in a 10 inch cast iron skillet and place on the center rack of the oven. Combine the flour, cornmeal, sugar, baking powder, baking soda, and salt in a bowl. In another bowl combine the oil, buttermilk, and eggs. Make a well in the middle of the bowl with the dry ingredients and add the bowl with the wet ingredients. Do not overmix or your cornbread won't taste as good. Remove the preheated skillet from the oven and turn the skillet in order for the sides of the skillet to be coated in oil. Pour batter into skillet and bake for 15-20 minutes. Let sit for 5 minutes and then run a knife around the edge to pop the cornbread out of the skillet. Serve with butter, honey, or sorghum. If you don't have a cast iron skillet this recipe can also be made in a 9 inch pyrex or metal pan. Don't pre-heat the pan. I do not recommend changing the oil to anything other than canola. Olive oil and coconut oil do not work for cornbread. Trust me I tried once just to see and it was pretty much horrible. Bacon grease works great, but I'm pretty sure I'm the only one with a giant cup of bacon grease in my fridge (my husband insists on bacon grease to oil the cast iron skillet). You can add jalapeños and cheddar cheese for a variation on this recipe. I have done it many times and it's great to go with chili! To season your cast iron skillet. scrub with soapy water. Then scour with coarse salt. This will get any of the dried food bits and dullness off. Rinse and dry well, do not let the skillet air dry this will lead to rust. Rub the skillet with vegetable oil using a paper towel. Place skillet upside down in a 350 degree oven and bake for one hour. Let skillet cool in oven. Once your skillet is seasoned it just need to be wiped out and then oiled after every use. You only need to re-season your skillet if it rusts or the surface looks dull or starts to stick. I haven't had to season my skillet in years, I just wipe it out, rub with oil and then store.